In 2012, Mike Mignola (Hellboy, Lobster Johnson, Baltimore) teamed with Christopher Golden (The Myth, The Boys Are Back in Town) to co-create and co-author the novel Joe Golem and The Drowning City. The tale takes place in an alternate timeline Manhattan, which is currently under thirty feet of water. Simon Church is a Victorian-era detective who is kept alive for more than a century via a complex combination of bio-mechanical magic, clockwork gears, spit, and shoelaces. His assistant, Joe Golem, has bizarre dreams that speak to him of a former life. He has visions of being mud and stone and hunting witches. Unfortunately, he can’t quite piece together his own origin. Four years after the release of the illustrated novel, Mignola and Guest revisited The Drowning City with a five part prequel comic book miniseries, The Rat Catcher and The Sunken Dead. Patric Reynolds (Aliens: Fire and Stone, Hellboy and the BPRD: 1954) did the art for Rat Catcher and is also the artist for this new series. Reynolds brings an aesthetic to the project that looks like it’s straight from a pulp mystery novel. The Drowning City doesn’t exactly look like a place I’d want to raise children but I’d definitely want to explore it in daylight. Mignola and Golden give us a script that will appeal to fans of horror, pulp, noir, steampunk, monsters and magic. There is enough backstory that a new reader can easily pick up the series. However, if you haven’t already read The Rat Catcher and The Sunken Dead, I’d recommend picking up the hard copy. 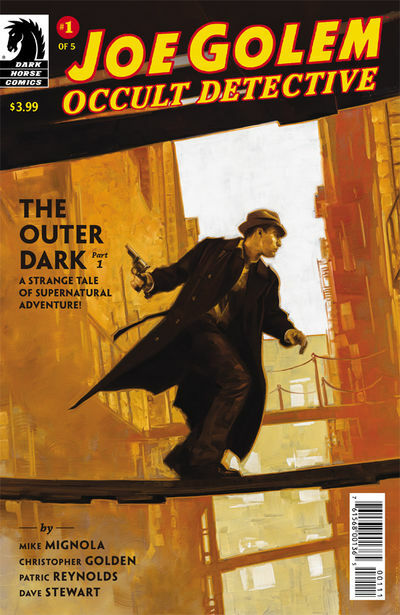 Readers of series like The Goon and The Damned will feel right at home with Joe Golem. This week’s New Comic Book Day Reviews brings us a quartet of books that we feel comic reader should check out. From Dark Horse we’ve got Black Hammer #9, Valiant brings us their next big story arc with Rapture #1, we take a trip with Peter Quill in Marvel’s Star-Lord Annual #1 and DC brings us home with Detective Comics #957. As a reminder these are only a few of the awesome comics that came out this week. Check out our other blog articles so see our thoughts on other books. Be sure to comment or share our post on Facebook or Twitter if you like our articles! Black Hammer has to be one of the most exciting “Golden Age” superhero tales in a long time. As it slowly unraveling why everyone is stuck at Black Hammer Farms. Black Hammer #9 delves into how Talky-Walky and Colonel Weird met. Distress signals in space never seem to be a good thing, unless it’s meeting your best friend. It’s hard to say that this issue of Black Hammer was a fun read. However, that’s mainly due to what’s been happening throughout the series. It was great to see how Talky-Walky and Colonel Weird met. That was a fun ride. I always enjoy annuals for the small break it typically gives us from the norm. 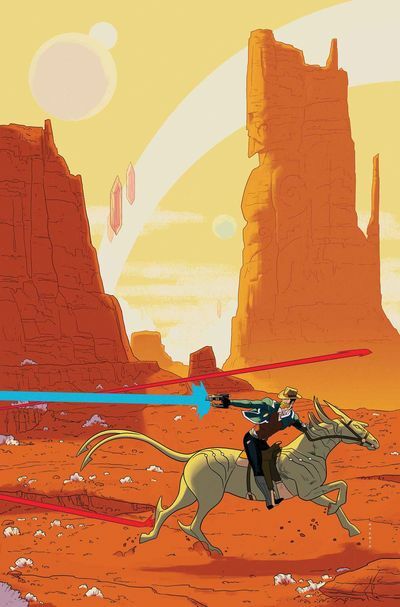 Chip Zdarsky’s Star-Lord Annual #1 is no exception. Find out what all the Guardians are up to! If you’re like me and haven’t read a lot of the new Valiant books, a crossover story like Rapture #1 seems a bit daunting. While I enjoy X-O Manowar, I’m not that familiar with the other fascinating characters in Valiant’s stable. 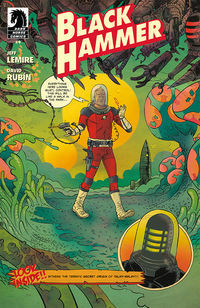 However, Rapture #1 by Matt Kindt is an excellent jumping on point for new readers while still offering something that longtime Valiant readers can sink their teeth into. 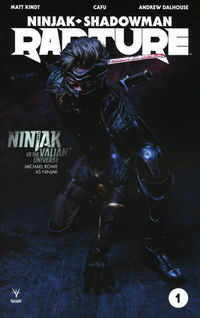 Rapture #1 focuses on four characters: Tama, Ninjak, Punk Mambo and Shadowman. Kindt gives each character a unique voice and the reason these characters come together is compelling. It’s definitely made want to check out some more stories featuring Shadowman and Punk Mambo. Artist CAFU knocks it out of the park, making each location feel unique. You’ll feel the stench of death oozing out of the Deadside. Check out all of our Valiant comics! 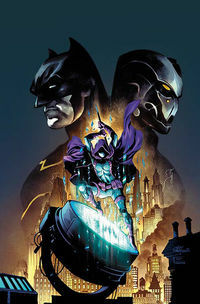 Detective Comics #957 is something you don’t often see in today’s comic books: a standalone story. James Tynion IV presents us with a brief interlude between arcs with “The Wrath of Spoiler,” a story that follows Spoiler (obviously). The story that Tynion IV tells here is one that is often talked about among creators: Does just the mere presence of Batman bring about crime? Would these villains exist if they didn’t have Batman to challenge them? Spoiler seeks to answer that question as she fights against an updated Wrath and Scorn, a team of villains who are looking to make a name for themselves. The art by Carmen Carnero is refreshingly old-school in all the best ways and is some of the best art I think we’ve seen in Detective Comics yet. Catch up with Detective Comics and Rebirth with our graphic novels! 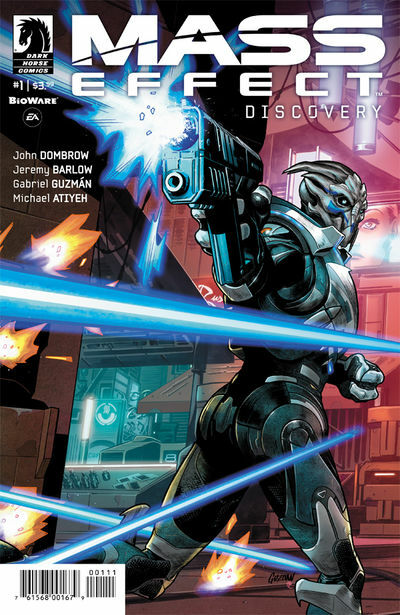 Mass Effect: Discovery #1 is one of the most anticipated comic releases of the year. This comic promises to dive deeper into the Andromeda Initiative introduced in March’s Mass Effect: Andromeda video game. Dark Horse is no stranger to Bioware’s many video game worlds, but this is one the most promising storylines in their partnership. The first issue alone delivers on several of the promises made to fans during the initial production of the game. Namely, it uncovers significant dangers lurking in the Initiative’s long cast shadow. It comes as no surprise that this story is compelling when you look at the creative team bringing it to life. John Dombrow, lead writer for both Mass Effect 3 and Mass Effect: Andromeda, has written a story that ties heavily back into the events of Andromeda. Artist Gabriel Guzman illustrates the comic, subtly luring readers back into the Mass Effect universe. He does this through incredible images that seamlessly recreates the iconic imagery of the games. His attention to detail hints at deeper connections to the greater Mass Effect storyline. The story itself is mostly told in flashback. The reader meets a side character from the game, Tiran Kandros, as he is reeling in the aftermath of a battle. Kandros, who is the leader of Nexus’ militia in Andromeda, is a much more significant character than the game would have you believe. While Tiran is just another NPC in the game, this comic shows us how he is so much more. Iran is a spy, infiltrating the Andromeda Initiative through the Nexus colony. The player only receives a few tidbits of information about Tiran’s life from before you meet him in the game. However, this comic blows apart any banal conceptions a player might have had of him. Despite his background role in the game, as the comic unfolds, it’s clear that Tiran is one of the most integral characters in the story of Andromeda. Through Tiran, we glimpse into not only the Turian perspective on the Initiative, but the resistance against it as well. Mass Effect: Discovery hits the shelves Wednesday, May 24th. Make sure to grab a copy at TFAW.com and don’t miss the beautiful variant cover by artist Kate Niemczyk. Until then, guys, keelah e’lai. Check out all of our Mass Effect products! 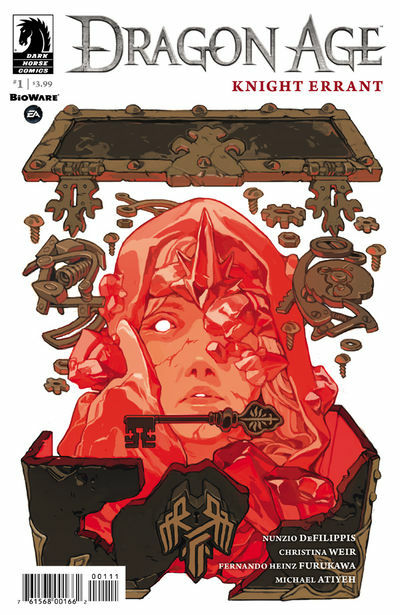 Those familiar with the Dragon Age series know that the world of Thedas has a rich undercurrent of stories that are just waiting to be told, and one such tale is the subject of Dragon Age: Knight Errant #1. Even if you haven’t played through the popular Bioware franchise, this comic stands up on its own merits. While there are elements that people who are completely new to the world will not understand fully, I have hope that the subtle storytelling of the writers will integrate the information in later issues to better introduce new readers to their world. For long-time fans of the series, there are several nods to previous events in the games and to the first comics miniseries by Dark Horse, Magekiller. In the latest team-up between Bioware and Dark Horse comics, Dragon Age fans are introduced to a young rogue named Vaea. Vaea is squire to the much venerated knight Ser Aaron Hawthorne, who is drunk not just on wine, but also on his imaginings of his own glory. However, Vaea is more than just a simple servant to the grandiose man; she is also an elf motivated by the plight of her people. Using Ser Hawthorne’s influence to travel, Vaea steals in order to share with the disenfranchised elves who are sequestered in the alienages of Thedas. We first meet Vaea as she and her patron are on their way to Kirkwood to visit fan favorite Varric Tethras as he’s on the edge of being appointed Viscount of the troubled city. While Ser Hawthorne is busy spinning drunken tales to a party held in Varric’s honor, Vaea sneaks out to meet up with a former Templar named Ser Nevin Faramore. Faramore had worked directly for Knight Commander Meredith before she was destroyed by Red Lyrium at the end of the second Dragon Age video game. Faramore hires Vaea to sneak into the Gallows to retrieve a box of treasures that Commander Meredith had hidden before her death, to which only he possesses the only key. What follows reveals Vaea’s true character as she instead steals the key away from Faramore in order to bring the treasure to the elves of Kirkwood. Vaea’s Robin Hood-esque endeavors don’t go unnoticed, however. Almost immediately, Varric shows interest in the woman, quickly recognizing that she is up to more than she seems and giving her the nickname of “Fingers.” Vaea is also approached by a mysterious woman, who insinuates that Vaea has stumbled into a situation much larger than she had originally bargained for through veiled threats about the Inquisition. This story promises to explore the schism between elves and humans in the world of Thedas, a schism that has been the source of unending strife since the beginning of the franchise. In one scene, the reader is shown a blithely racist conversation happening amongst a bunch of well-to-do humans while Vaea has to placidly stand by. In addition to this, there are conversations about slavery, poverty, and the wars that have marred the landscapes of Thedas for generations. Whether you’re a long time fan of Dragon Age or completely new to the series, this comic is engaging and lures you deeper into the world that Bioware has made for their incredible games. While this first issue is peripheral to the main storyline of the series, the overall tale hints that it will reveal some secrets left over after the end of the last game. Between the compelling new characters and at least one returning fan favorite, Dragon Age: Knight Errant #1 will draw you deeper into Kirkwood and the dangers that hide in its shadows. Hungry for more Dragon Age products? We’ve got playing cards, graphic novels, patches, and more! Leave it to Geoff Darrow to begin a new issue (and a new series) with a trio of talking vultures. The triad is circling the remains of a huge battle to find their next meal. And they provide the most intelligent dialogue in the book. In The Shaolin Cowboy: Who’ll Stop the Reign #1, Cowboy doesn’t have much to say. That leaves the vultures and less-intelligent humans to fill in the story. That plot revolves around a number of enemies trying to take advantage of Cowboy’s weakened state. Those include the vultures, a warden from hell, and a beer-guzzling crab-human hybrid. It’s quintessential Darrow. And that’s a beautiful thing. But it’s detailed artwork that Darrow fans demand. And this issue doesn’t disappoint. While the book doesn’t have the decapitation by chainsaw on a rope that we’ve come to expect from the Cowboy, there’s still plenty to feast your eyes on. There are impossible moves where the Cowboy propels himself into the back of a moving car. Bleak mountain landscapes complete with anti-Trump graffiti. And the generous use of two-page spreads with knife-legged dogs as a treat for the careful observer. Darrow creates a visual treat that will leave you coming back for the rest of this four-part series. The Shaolin Cowboy: Who’ll Stop the Reign? #1, Dark Horse Comics, Released April 19, 2017, Written and Art by Geoff Darrow, Colors by Dave Stewart, Lettering by Nate Piekos, $3.99. Few television shows inspire as much loyalty from die-hard fans as Firefly, Joss Whedon’s 2002 science fiction-Western hybrid. Capitalizing on the demand for new stories after the 2005 feature film Serenity, Dark Horse Comics has published several limited series. Its latest, Serenity: No Power in the ‘Verse #6, concludes with bang. In addition, the book has nailed the feeling of the beloved – but short-lived TV show. There’s the Western-style dialogue (“We put up a good fight for a spell.”). And the occasional Chinese curses (“Bi zui!”). Georges Jeanty’s realistic artwork lets us revisit our favorites characters. Capt. Mal Reynolds, mercenary Jayne Cobb, psychic River Tam all make appearances. The new book takes place after the events of the Serenity movie. No Power in the ‘Verse sets the stage for a new uprising against the evil Alliance and its band of all-powerful psychics. Reynolds and his crew are caught in the middle forced to rescue River and other friends. This is also all happening while trying to figure out who are their friends and their true enemies. However, instead of neatly wrapping up the story, writer Chris Robertson sets the stage for the next as-of-yet unannounced next limited series. The battle lines have been drawn–both within Serenity crew and between the crew and the Alliance. And the next installment can’t come soon enough. Rebels: A Well Regulated Militia was released in 2015 to tell the story of Seth and Mercy Abbott. Set in 1775 colonial America, the series followed the newlyweds through the War of Independence. Seth was a volunteer in the militia who helped birth a nation. Rebels: These Free and Independent States #1 picks up the story in 1794. Seth and Mercy’s son, John, has come of age. The boy is a savant who knows everything there is to know about ships and seafaring. He can readily identify any ship by silhouette alone, but has difficulty with social situations. This is a historical period that saw danger to the fledgling Union from the Barbary Coast, Britain, and political infighting. In the midst of all this uncertainty, the Abbotts must decide what will be best for their odd son. Writer Brian Wood (Aliens: Defiance, The Massive, Northlanders) transitions easily from the end of the first season into the beginning of season two. However, readers who haven’t read Militia won’t have any trouble jumping in with Independent States. Wood’s script brings emotion and realism to stories that most people have at least a conceptual knowledge of. It can often be difficult to envision history as actual events with living humans who have feelings and relationships. While Wood makes it clear in his disclaimer that his characters never actually existed, they fit beautifully into historical context and give faces to an important era in American history. You don’t have to be a history buff in order to enjoy Rebels. While the period details will appeal to history buffs, there is plenty of meat on the bone for action adventure fans. Neil Gaiman’s novel American Gods is based on the idea that where believers exist, their gods also exist. Immigrants to the United States bring versions of their gods with them. As long as believers hold their faith, the gods flourish. The more believers in one place and the stronger their belief, the bigger and more powerful a deity. When a belief system breaks down, the forgotten gods lose their power and eventually disappear. Old gods are constantly fighting to keep their foothold in a society where new gods are constantly popping up. Ever wonder why the Old Testament God was so adamant about graven images? American Gods: Shadows #1 introduces Shadow Moon, a convict who is released from prison a few days early to grieve. His wife was killed in an auto accident the week before Shadow’s scheduled release. On his flight home, Shadow has an uncomfortable meeting with Mr. Wednesday. The grizzled old man offers Shadow a job after demonstrating impossible knowledge of Shadow’s past and present. Taking Wednesday for a grifter, Shadow declines and the two part ways. Unbeknownst to him, this isn’t the last time Shadow will encounter Mr. Wednesday. Shadow likewise has no idea how thin his perception of reality is about to stretch. A Superstar Lineup. Neil Gaiman! P. Craig Russell! Scott Hampton! P. Craig Russell is no stranger to adapting Gaiman works. Russell provided art for Neil Gaiman’s Sandman series, Coraline, and the Graveyard Book. This time he takes the reigns, writing the script with Gaiman available as a consultant. American Gods: Shadows will appeal to fans of the source novel, action-adventure, fantasy, horror, Americana, and mythology. The Mask: Who Wore It Better? Comic book movies are big business. Marvel’s The Avengers made $623 million at the box office. DC’s The Dark Knight made $534 million worldwide. It should come as no surprise that Hollywood execs look to the pages of popular comics for inspiration. More films than you might think began life as comic books/graphic novels. Some are obvious comic book adaptations, like the Marvel Cinematic Universe and DC’s Extended Universe. Others, you wouldn’t know without having first been exposed to the printed source material. In 1994, New Line Cinema turned Dark Horse’s The Mask into a film starring Jim Carrey. The premise of the film is simple. A lovable loser name Stanley Ipkiss finds a green mask. When he dons the jade mask, he gains extraordinary powers including shape-shifting, superhuman strength, and near invulnerability. It’s Party Time! P! A! R! T! Y? Because I Gotta! Along with the physical changes, Stanley undergoes a shift in personality. The mask takes away his inhibitions and pumps his Id into overdrive. He becomes a benevolent, mischievous sort of superhero. In the film, Ipkiss’ alter ego is referred to as The Mask. The backstory given is that the mask is a depiction of Loki, Norse god and trickster. In the end of the film, Stanley gets the girl and ditches the mask in the river. The story ends up being a classic happily ever after, because Hollywood. The comic book source material is much darker. “Big Head,” as The Mask’s main character is known in the early books, is based off black comedy characters like The Joker, The Creeper, and Mr. Hyde of Jekyl and Hyde. The movie is rated PG-13 for “stylized violence.” The comic is rated 14+ for comedic ultra-violence. Don’t Put It On! Don’t Ever Put It On!! The comic book Ipkiss is a weak and neurotic character. He purchases the jade mask as an apology gift for his girlfriend. After the mask begins speaking to him, Ipkiss tries it on and transforms into Big Head. Stanley goes on a brutal killing spree, targeting people he believes have wronged him. His nocturnal expeditions begin to take a toll on Ipkiss. He becomes verbally abusive to his girlfriend Kathy and she throws him out. Stanley breaks into her apartment and steals the mask, which she has kept. Technically, it belongs to her. Later in the story, Kathy will shoot Stanley and take the mask, becoming the second Big Head. Later still, Lieutenant Kellaway will don the mask and become the third Big Head. After Kellaway, there are a string of other Big Heads. The mask itself is the character, regardless who is wearing it. Jim Carrey was an excellent choice to portray Ipkiss/Big Head/The Mask in the film adaptation. Many of the practical effects were created solely with prosthetics and Carrey’s ability to effortlessly twist his face inside out. The more spectacular effects were done with CGI that was cutting edge at the time the film was released. The CGI effects have aged, but not as badly as some of the other films from the same era. With that being said, there are no restrictions on comic book effects. There are no budgetary constraints. There are no limits on how many explosions a sequence can have or how gory a sequence can be. There’s no struggle between using hokey practical effects or digital effects that look cool today, but may look awful in ten years. Technological advances in home entertainment are rarely kind to older effects. The toned down horror elements in the movie allowed a larger audience to be exposed to the story. The movie evolved into a sort of violent comedy rather than a funny horror story. There are several scenes in the comic where Big Head appears to be wearing the skin of his victims as disguises. It’s hard to imagine Jim Carrey pulling off an Otis B. Driftwood (From The Devil’s Reject) on the silver screen. Comparing mediums is difficult when talking about a movie adaptation of a comic. Fans who have read the book prior to seeing the film may be disappointed that their favorite scenes were condensed, changed, or simply omitted entirely. People who buy the book after seeing the film may be surprised by the darker tone and the hyped up violence. It simply boils down to this: Movies aren’t books. It just isn’t possible to translate some material from graphic novel to live action. Conversely some of the material works better on screen than on the page. So, the book is better. The book is always better. Except when it isn’t. But in the case of The Mask, the book is the winner. Slayer has dominated the thrash metal scene for nearly four decades. Then in 2015, the band teamed up with director BJ McDonnell (Hatchet III) to write and direct a music video for their song Repentless. The band was blown away by the resulting video. Repentless received an overwhelmingly positive public response. The music video has over ten million YouTube views. Based on the reception of Repentless, Slayer went back to the well. They hired McDonnell to write and direct a prequel and a sequel video. The videos, in chronological order, are You Against You, Repentless, and Pride In Prejudice. Slayer: Repentless #1 is an extension of the storyline that runs through the three music videos. Writer Jon Schnepp (Metalocalypse) offers a script full of violence, racial tension, and gore. And he brings depth to a familiar story and invites the reader to join him on a brutal and horrific journey. In addition, artist Guiu Vilanova (Weird Detective, Twilight Zone) is well known for his diverse settings. In just the first couple pages, he takes the reader from a murder scene in suburbia through a peaceful foster home to a Neo Nazi rally. Scene transitions are seamless and easy. As a result, the action sequences, facial expressions, and body language are all spot on. However, the appeal of Slayer: Repentless doesn’t end with Slayer fans. This series has that dark dramatic quality of series like Jessica Jones, Gerry Conway’s classic Punisher, and Constantine the Hellblazer. But none of the characters are really baby faces. Some are just worse heels. Everyone’s favorite vampire with a soul is back. Spinning out of appearances in the successful Buffy The Vampire Slayer and Angel & Faith series, Angel stars in his own solo series again. In Angel Season Eleven #1, Angel and his longtime associate Fred investigate a haunting in a Dublin hotel. However, the investigation soon leads to memories from Angel’s very dark past. What do these memories mean and why are there so many bugs in them? These questions lead Angel and Fred on the mystery that forms the spine for the series’ first arc. Angel’s past as the villainous vampire Angelus has always been ripe for story potential on TV and in comics. It’s a strong choice to make his backstory a cornerstone of this series. Angel is one of the most haunted characters in pop culture. Writer Corinna Bechko uses that to blaze forth a new storyline for him. The other interesting thing about the book is the inclusion of the character of Fred. Viewers of the TV show know Fred’s body was possessed by the ancient demon Illyria in the final season. In this new series Fred tries to share her body with Illyria. As you can imagine, a modern-day girl and an ancient demon don’t make the best pair of body-mates. However, with Illyria inside her, Fred is able to access powers important to revealing the truth about what’s going on in Dublin. Angel has always been a fan favorite character within the Buffy-verse. So, it’s nice to see him in his own series again. Based on this first issue it seems like a lot of narrative seeds have been planted. This makes for a large-scale adventure for the issues to come.